Bombs raining down all around the place I was in, the past two nights were two of the most horrific nights I had to live in my entire life. The building shook back and forth with every bomb which hit the neighbourhood, and, as I tried to stand my ground, my two sisters sat next to me, petrified, tears running down their faces. It was a complete blackout, and I could see things around me only thanks to the light coming from my laptop. My mother was yelling, my father was opening the windows which, surprisingly, had not been shattered to pieces like most of our neighbours’. Angry and frustrated, I packed my laptop, picked my phone up, and headed downstairs. I was out in the street now. An utterly dismal view. Groping my way through the darkness, I carefully felt my steps on the shattered glass all over the place. I still could hear constant Israeli bombing in the distance. I saw people fearfully rushing across the streets into their houses. In a short while, I was called again by the CNN producer, who kindly checked on me and my safety before I requested that we resume over the phone the interrupted discussion I was having with the Israeli guy from, or to be more accurate, in the Israeli town of Ashkelon – where, as it happens, my own grandfather once lived before Zionist troops forcibly expelled Palestinians from their homes and ethnically cleansed their lands in 1948 (as documented by Israel’s New Historians). When the last blast took place and I got disconnected, I had been trying to make a point. During every cycle of violence like the one taking place currently, the notion of victimhood becomes the main theme dominating most of the discussion over this conflict. The blame game soon starts, with the question of who initiated the attacks at its centre. However and for one to put things into clear perspective the question which needs to be addressed is not only that of who is responsible for the current cycle of violence, the civilian deaths, injuries as well as the colossal damage done to civilian property, however important that is. The principal question, rather, is to do with the larger context within which violence takes place, one that breeds violence, a deeply vulnerable situation which makes any ceasefire highly unsustainable. In short, one has to address the root cause of this conflict first. Dealing with the conflict in Israel/Palestine, one has to put things in their proper context. This is not a conflict between two equal parties, as most of media coverage misleadingly portrays it. There clearly exists a huge power asymmetry in favour of Israel which has to be taken into account in any discussion of this conflict. The case of Israel/Palestine is one of military occupation, of a civilian people living under the military rule of a foreign occupation maintained by one of the strongest armies in the world, the strongest in the Middle East, and a nuclear power with a sizable nuclear arsenal. The Palestinians in Gaza – despite the fact that there is no actual Israeli presence on the ground – are still subjected to living under Israeli military rule which continues to ruthlessly control every aspect of their lives. Moreover, the civilian population in Gaza has been subjected to a hermetic blockade which has been imposed by the government of Israel for over six years now and which, according to an official UN report, amounted to collective punishment. As was clearly highlighted in Mehdi Hassan’s piece in the Huffington Post, Israel continues to control the airspace, territorial waters, and the border crossings in Gaza (apart from the Rafah crossing border with Egypt). The population of Gaza, of over 1.7 million civilians, has been systematically oppressed by the government of Israel, subjected to all forms of institutionalised violence, both direct and structural, and strictly punished for merely exercising its democratic right, having elected a Hamas government in January 2006. Examples of the systemic oppression of the Palestinians can also be seen in almost every aspect of Palestinian life, and have affected almost every layer of Palestinian society: it is embodied in the everyday suffering of Palestinian farmers who are unable to reach their farms in access-restricted areas (many of them were killed while trying to access their lands), the hardships of fishermen who are regularly shot at, arrested and their boats confiscated, the anger and frustration of students and youth to whom being on the other side of the Rafah crossing has become almost an unthinkable wish, the agony and stress of traumatised children who grow up to the sound of Israeli F-16s bombing their neighbourhoods. It is also manifest in Gaza’s crippled economy, in its stunted growth, in the high levels of unemployment amongst youth and almost complete dependency on humanitarian aid, in the sharp shortages in basic food stuffs and medicines, in the tight obstruction of the process of reconstruction, in the routine 10-hour daily power cuts, which all have become an integral part of their lives. Based on this, an account which takes into consideration the power imbalance will therefore be able to produce the aggressor-victim polarity where, although two wrongs do not make a right, the violence inflicted by the Palestinians, represented in Palestinian rocket fire from Gaza— a wrong— should by no means be equated to the greater wrong represented in the root cause of this conflict, namely Israel’s continuous and multi-faceted oppression of the Palestinians (I note parenthetically here that the concept of victimhood is not necessarily mutually exclusive, meaning there are also victims on the other side of the conflict). Therefore, as Ilan Pappe has noted, although there is violence perpetrated by the Palestinians, “no injustice was inflicted by the Palestinians on the Israelis, just as no injustice was inflicted by the Algerians on the French colonialists although there certainly was violence” (Beyond the Destruction of the Other’s Collective Memory, 2003, p. 31). This furthermore is closely tied to the blame game which immediately follows every Israeli escalation in Gaza: Israel, on the other one hand, blames Palestinian groups in Gaza for “constantly firing rockets into Israel” and portrays itself as merely striking in self-defense, whilst the Palestinians, on the other, perceive of themselves as merely fighting back, blaming Israel for being the main reason behind repeated rounds of violence, having initiated the attacks first. Nonetheless, and despite the fact that, as Ali Abunimah shows, it is Israel who initiated this cycle of violence, without first grasping the larger context I just described above, the question of who initiated the attacks against the other and presenting a timeline of the events is, I believe, insufficient to justify either claim against the other. The above context is, in and of itself, a raison d’être for the repeated cycles of violence in the region and is enough reason to legitimate the Palestinian right to fight against Israel’s oppression in all its forms, particularly its less obvious form represented in its omnipresent, institutionalised, and structural violence in the Gaza Strip. Over the past few days, I have been appearing on several Western media outlets and news channels (including the BBC, CNN and Sky News) to discuss the current situation in Gaza. This is despite their blatantly biased coverage of the conflict. I have never been able to give a clear-cut answer to this question. How could I possibly answer this question when my mind is haunted by the images of dozens of amputated, dead bodies of Palestinian babies and children, some torn into pieces, and piled up upon one another? The sound of a Palestinian rocket fired into Israel, I will not hesitate to say, soothes the outrage that seeing these babies fills me with; it reduces the sense of powerlessness I am left with in the wake of every Israeli bomb dropped onto my neighbourhood, shaking my whole existence. Palestinian rocket fire into Israel is understandable. It is, if anything, symbolic. It is a declaration of existence, a determined act of rejecting one’s own humiliation at the hands of their occupier, and of refusing to accept the legitimacy of their oppressor. Whether indiscriminate Palestinian rocket fire into Israel can be justified or not is, in my view, an irrelevant issue insofar as the amount of harm caused by these rockets is incomparable to the huge number of people killed and injured and the colossal damage brought about by Israeli violence. When speaking about violence, it is, as Said consistently argued, the greater violence which is the root cause of the conflict and which constitutes a great injustice that needs to be addressed – and eradicated. Having said that, if anything needs to be said about what Israeli civilians have to go through, and contrary to what Israeli officials would like us to believe that “Hamas is committing a double crime by killing Israeli civilians and using Palestinians as human shields,” it is the government of Israel who should be held accountable for, well, the suffering of its own citizens as well as the greater, and by no means comparable, suffering of the Palestinians. This Israeli escalation is eventually going to end, and it is only a matter of time before everything goes back to how it used to be before the start of the Israeli assault six days ago. More Palestinian blood will be shed before the Palestinians, faced with no other option, accept a truce, which will sooner rather than later be violated again. However, this is not what the Palestinians in Gaza really want, and this is not what their fight has been for. Whilst Israel, as is the case with previous incidents, commits more crimes against Palestinians and easily gets away with it, Gaza will soon be flooded with more foreign aid and perhaps Qatari money in order to “stabilise” the situation. Nevertheless, what has been happening lately has reminded the world this place is never a normal or a stable one. Foreign and humanitarian aid meant to perpetuate the status quo will ultimately fail insofar as it continues to avoid addressing the root causes of the conflict. Palestinians should no longer accept the ‘ghetto life’ they have had for the past six years. They have not paid dearly to only be not disturbed by Israeli drones and F-16s flying in their sky. The blockade will continue: the Israeli navy will soon be shooting at Palestinian fishermen and terrorising them in the sea, and every now and then we will hear about a Palestinian farmer shot dead by Israeli snipers while trying to reach his farmland. Travelling through the Rafah crossing will continue to be a lengthy and hugely painful experience for every Palestinian who wishes to travel. Moreover, being able to travel to and visit the West Bank will continue to be an impossible scenario in the mind of every Palestinian in Gaza. Corruption will continue to grow and spread within political elites in both Gaza and the West Bank whilst the political divisions will only deepen. The appalling suffering of the Palestinians in East Jerusalem and the West Bank will gradually become irrelevant to us. Contrary to what we were told, existence, in this case, is not act of resistance. The Palestinians’ fight however has always been one for grander goals: freedom, justice, and equality. Occupation has to be fought, and a unified, clear, and systematic strategy needs to be developed by Palestinians everywhere in order to defeat Israel’s continuous oppression and ethnic cleansing against our people. Ed Frias you mentioned that the author of this article said, Palestinian rocket fire into Israel is understandable. This is how all the hostilities started. Hamas fired a rocket from Gaza at Israel and injured 4 Israelis including blinding one Israel. Until you change the radical behavior of Palestinians i dont think peace is possible. 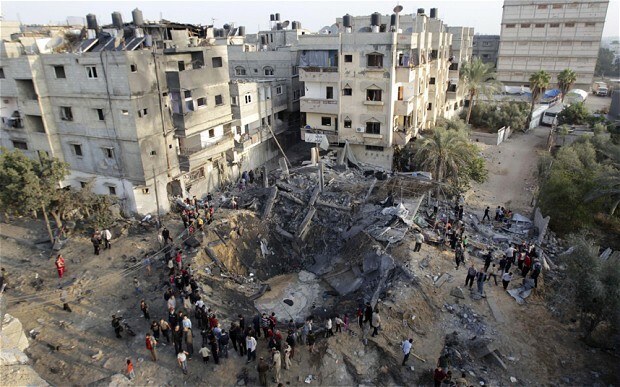 Palestinians have to understand you cant fire missles at Israeli civilians. 2nd, Gazan’s are free to travel anywhere they want by going through the Gaza Egypt border which is controlled by Hamas ally the Moslem Brotherhood. An essay full of truth and powerful enough to disturb those that will stop at anything to defend the ruthless Israeli occupation no matter what. This lust for violence and spewing of hatred from Israeli supporters can only be described as pathological. They scare me. Any decent human must reject such sickness and speak out for the right and dignity of all humans beings, including Palestinians. Keep writing and keep bringing awareness of how it is on the ground it’s very poignant to hear your story and the bombs going off in the background speak greater volumes than trolls with a love of their own copy and paste words. Ed Frios you speak of aggression and a variety of other complaints yet your own narrative is offensive and hate riddled, no better than the worst of Hamas and other extremists. Unfortunately that seems to be the case with the situation at hand. Two groups of polarised extremes united in only their mutual hate with civilians on both sides of the border caught in the crossfire. Lets hope we can find a way to a ceasefire for both those in Gaza and Ashkelon. i thought that ‘ethnic cleansing’ denoted a singluar act over a specified time, link all these acts into a “systematic” and “continuous oppression” and this is called ‘genocide’… need to name the crime. with the widespread acceptance of zionism around the world, amongst all religions and regions, it is surely up to everybody to tackle them wherever they find them – academically, economically… religiously! We have removed a series of comments that were pasted in from elsewhere on the web. Opinions are welcome, spam isn’t.